We hope you’re already thinking of Flipkart Music Masti ideas. If not, this will perhaps motivate you Two mega winners will receive a Casio CTK-3500 Keyboard & a Kadence Concert Ukulele respectively, and five additional winners get flipkart gift vouchers worth ₹1,000 each. Excited? Well, what are you waiting for? It’s time to get your groove on MaalFreeKaa.in No. 1 In Online Contest, Free Giveaway, Free Sample, Freebie Deal website providing you better freebie prize and online competition also you find all Football World Cup 2018 Like FIFA Football Contest and much more you win daily when you visit daily our website now today we are shared biggest contest of football world cup. June 21 is World Music Day, and Flipkart is looking for the most talented secret superstars. Sing the words ‘Flipkart’, ‘Music’ and ‘Masti’ and create an original 60-second music video. 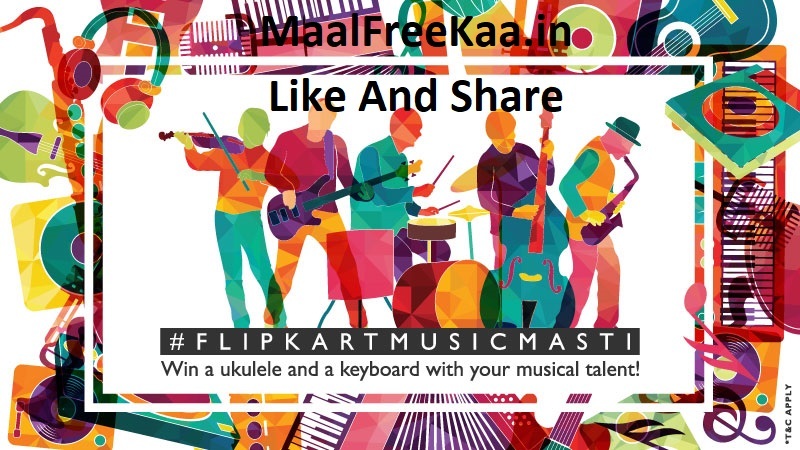 Post it on Instagram with the hashtag #FlipkartMusicMasti. Two lucky winners stand a chance to win a Kadence concert ukulele and a Casio keyboard. Five additional winners will take away prizes worth ₹1,000 from Flipkart. Get your groove on. Last date for entries is June 21, 2018! Contestants are required to create a 30-60 second original music video. The music video must include the contestant(s) singing the following words: Flipkart, Music & Masti. The music video must be posted on the contestants’ own Instagram account between June 14 and June 21, 2018 by 11:59 PM IST. The music video can be created by individuals, bands or collaborators. All entries must use #FlipkartMusicMasti and #WorldMusicDay and tag @FlipkartStories and three active Instagram accounts (friends). Entries must be original compositions and should not infringe on copyrights of a third party. Cost of production of the music video shall be borne by the participants themselves. Entries must not contain any profanities or indecent references/insult to any community. The choice of language, instruments and genre are open. All prize-winning entries will be showcased on Flipkart Stories. Five additional winners are eligible to get EGVs worth ₹1,000 each.